L/ Certified, CARFAX 1-Owner, GREAT MILES 25,043! FUEL EFFICIENT 32 MPG Hwy/22 MPG City! Moonroof, Heated Seats, iPod/MP3 Input, CD Player, Dual Zone A/C, Keyless Start, Onboard Communications System, Satellite Radio. AND MORE! Sunroof, Turbocharged, Satellite Radio, iPod/MP3 Input, CD Player, Onboard Communications System, Aluminum Wheels, Keyless Start, Dual Zone A/C MP3 Player, Keyless Entry, Steering Wheel Controls, Child Safety Locks, Heated Mirrors. PREMIUM PACKAGE Back-Up Camera w/Dynamic Gridlines, Heated & Ventilated Front Bucket Seats, BLIND SPOT MONITOR W/REAR CROSS TRAFFIC ALERT lane change assist, Electrochromatic Mirrors, INTUITIVE PARK ASSIST front and rear sensors, ACCESSORY PACKAGE Cargo Net, Carpet Trunk Mat, Key Gloves, Alloy Wheel Locks. 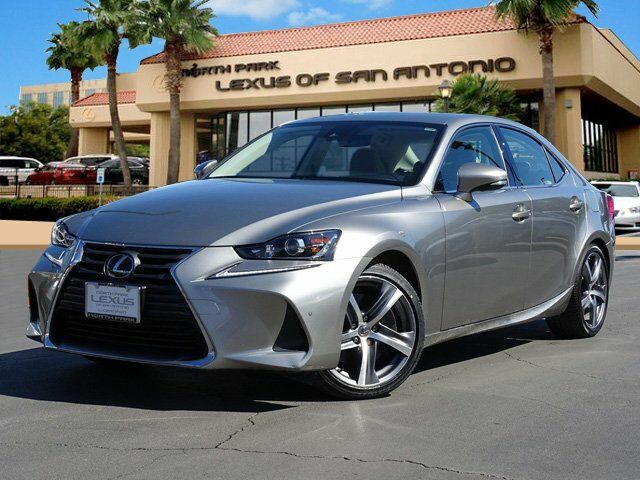 Lexus IS Turbo with ATOMIC SILVER exterior and CHATEAU interior features a 4 Cylinder Engine with 241 HP at 5800 RPM*. Blind Spot Monitor, Cross-Traffic Alert, Electronic Stability Control, Brake Assist, 4-Wheel ABS, Tire Pressure Monitoring System, 4-Wheel Disc Brakes Great Gas Mileage: 32 MPG Hwy. KBB.com explains "Take it to your favorite mountain road and prepare to be rewarded with sharp turn-in and gratifying amounts of handling and horsepower. ".